Bigfoot Bud, the shop on Main Street, is planning to hold an art show on Oct. 21 from 7- 9 p.m. If it works out, it could turn into an annual show or maybe even be able to show local area art works twice a year. Owner Joi Moshberger and her employees, including artist Elise Doveton, came up with the idea and appear to be making it work. They already have received more than 11 different submissions from 10 artists and are hoping and expecting to see more. Most are from the Molalla area, but others are from Portland. And it's not just pictures or drawings, there's an interesting box designed with holiday characters, such as Santa and his elves, the Easter Bunny and others, as well as wood art, painted Hip Cups, artsy designs, maybe some performance art and even a stuffed animal. The stuffed animal is actually Bigfoot, made by Moshberger, but unlike some of the other art, this adorable and very comfy animal is not for sale. Other works are. Available by each work is a little card with the artist's name and a price, best offer or not for sale. "We've already gotten more art work than we expected," Doveton said. She is an artist and was an art major at Portland State University. "This is important for Molalla. We need an arts guild and/or a commission because people in Molalla deserve it," she added. She also is responsible for the murals on the walls of the sales floor showing Mt. Hood and other mountains around the area. Every artist entering the show gets a Scrap $10 card, said Megan Watson, the shop's manager. Scrap is a second had art shop in Portland. Customers will choose the winner and second and third places. The winner will receive a $100 Visa gift card, while the second and third places will get $50 gift cards. The show will take place throughout the store, including the anteroom and the sales floor. It will be like any gallery showing. Guests mingle and talk without seeing or discussing any cannabis products, which all will be removed from the sales floor. 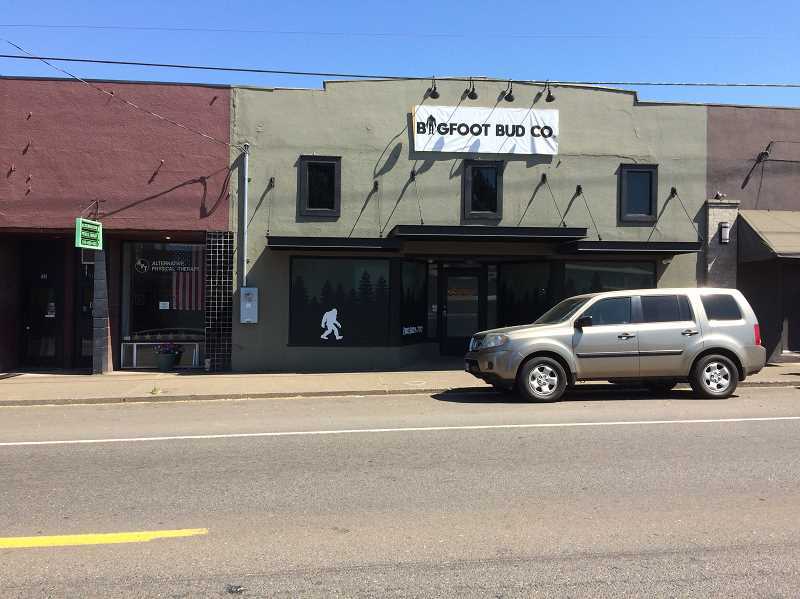 Bigfoot Bud is located at 109 West Main Street in Molalla.